The room comes equipped with all the mod cons. Dstv bouquet, tea/coffee and a fridge. Young and old can enjoy the calm that the tasteful decor offers. The upstairs seating area offers a leads onto the communal balcony. The dining area is bright and fresh and leads out to the pool deck. If you enjoy swimming, then I suggest that you ask for Room 2. A Gull keeps an eye on me. You can wall for kilometers from the guest house. you can walk/run to the V&A Waterfront. Or, like us, you can watch the sunset. 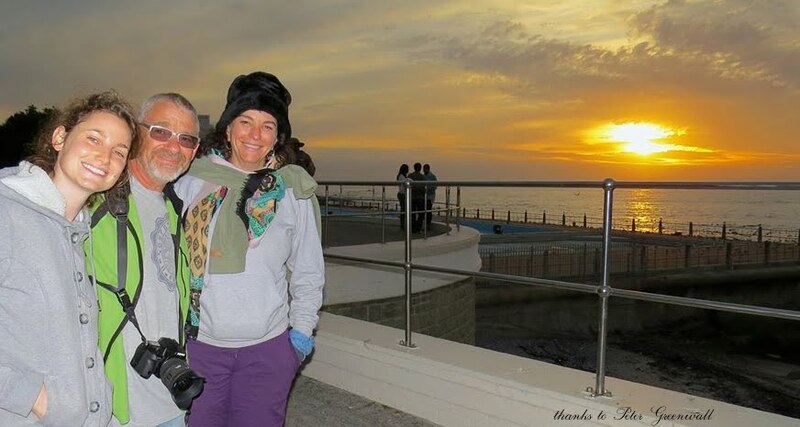 This photograph was taken by a friend that we bumped into on the promenade. We have not seen each other for almost 2 decades! The manager, Frank Malaba, is a gem.